Want to know the maximum amount of funding the State will pay a provider, minus the parent fee? 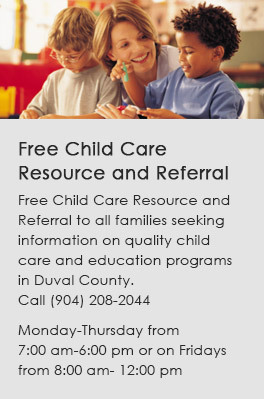 ELC of Duval determines your parent fee by calculating your household income, size, and eligibility category. CLICK HERE for an example of how to calculate the amount you may have to pay a child care provider. Make sure to ask your child care provider if these or any other fees are required before you enroll your child at a center or family child care home.